Intraocular lenses are implanted in almost all cataract surgeries. They replace the focusing power of the lens that is removed. They are essential to provide high quality vision after the procedure. Intraocular lens technology continues to improve. Today many different types of intraocular lenses exist. 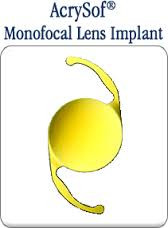 The original monofocal lens corrects vision for one distance. Multifocal lenses allow excellent distance and near vision without glasses in certain patients. Toric lenses can correct astigmatism and thus allow excellent vision in certain patients. After a thorough opththalmic evaluation, Dr. Mary will discuss your visual needs and together a lens type will be decided upon. Ultrasound measurements of the eye will be performed to calculate the appropriate lens power.